Bella LOVES her blanket. Everywhere she goes, Blanket HAS to go too. But when New Baby arrives, the only thing that will stop him crying is Bella's precious, sparkly, muddy, smelly blanket! Uh-oh. 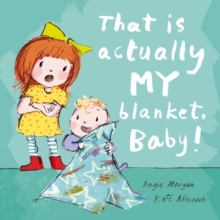 What's a big sister to do?With a heart-warming and funny text from Angie Morgan and beautiful illustrations from new talent Kate Alizadeh, That Is Actually MY Blanket, Baby! is the perfect book for little ones who are adjusting to a new brother, sister or baby in the family.